Email is without a doubt one of the most important communication tools for businesses. Many companies even use email to conduct marketing, sending out newsletters and other collateral, such as email blasts, to their existing and potential customers. While this form of marketing can be really effective, there is always the chance that your emails will be blocked by spam filters. If you are developing a new email marketing campaign, you need to first know a bit about spam filters. Because there are no set rules that all spam filter developers adhere to, you will notice that filters vary in how effectively they can block emails. Some filter nearly all spam while others filter only the most obvious spam messages. Getting past these filters takes trial and error but there are tips you can employ to succeed. It is worthwhile looking at the coding of your email. Because some email scammers include hidden HTML or other coding that the recipient won’t see in an email, many filters are now set up to scan the code of an email as well. You should get someone who is proficient to either develop a cleanly coded email template you can use, or to audit the code to ensure there are no problems. Beyond this, take a look at the actual content you are including in your email message. If you are including special offers, sales, and content that isn’t overly useful, there is a high chance that recipients will flag the email as spam, causing future communication that comes from you to be blocked. The most successful emails tend to provide useful information like how the product or service can be used, updates from the company, and even industry-related articles. Basically, anything that drives interest and the desire in the recipient to contact you about the service you provide. 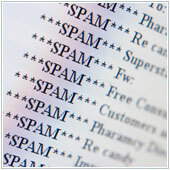 In an effort to cut down on spam, many email providers scan the subject line of emails for potential spam words. If these keywords are found, the email will likely be blocked. The challenging part about this, is actually figuring out which words will get through filters and which will cause an email to be blocked. One of the best resources we have found is this article on Hubspot. In general, good advice is to avoid cliche, and words that have come to be associated with sales oriented talk or jargon e.g., price, cheap, and no fees. Avoid special characters, like ‘$’ and ‘!’ in the subject line, as many spammers use these to try to grab the attention of the reader. In order to maximize the percentage of users who open your emails, clean out your subscriber list on a regular basis. Take a look for email addresses that have been deleted, or users who no longer work at the business. By auditing your subscriber list, you raise the chance that your emails will be opened and read by more recipients. You should also look into the email addresses themselves. If you are sending an email to a general account i.e., sales@company.com, you may not be actually reaching a real person, but an account that automates tasks instead. Try to send your email to individuals instead of general accounts. Testing your email before sending it out to your audience will help in ensuring that your email makes it through spam filters. The best way to test is to look for a spam testing solution. These solutions allow you to essentially send the email to a number of different services and clients, before presenting you with a report on whether your email managed to get through to the main services. You can test the email itself in different browsers. While many Internet browsers can render or show most emails, they will often render them slightly differently e.g., text will be bigger, or content may not expand to fit screen size. If the content looks weird to the viewer, there is a high chance that it will not be read and may be flagged as spam instead. As you may or may not know, there are actually verification procedures that users who send bulk emails must pass. These various procedures essentially let the different email services know that you, as the sender, are a legitimate business and not a spammer. The email be sent from the same IP and email address. The same name, address and information is in the From: header of every bulk email you send. Ensuring that the DNS (Domain Name System) records and address you use points to your company and are correct. Of course, this can take time and some knowledge of how the Internet and email works, so one option is to work with an email expert who can help you set up your server or third-party platform so that emails from you will be verified. If you are looking for a way to make your email marketing efforts more successful, or to ensure that they make it through spam filters, please contact us today to see how we can help.